As South Africans, we are a consumer-based society that purchases many different products on a daily basis. When a product that we have purchased breaks or fails, especially something that is relatively expensive, we automatically assume failure on the part of the product and question not only the quality of the product, but also the integrity of the manufacturer. A vehicle’s sole contact with the road surface is through the four tyres. Consider for a second the quality of some of our roads in South Africa. We tend to forget this as we make daily use of our vehicles. To the detriment of our own safety, or maybe just out of pure ignorance, we neglect the proper care and maintenance of our vehicles’ tyres. Tyre Wear: Why do we not get the mileage to which we are accustomed on our new vehicles? Tyre Wear: What causes the various types of wear? As a part of BestDrive’s Tyre Care advice and tips, we explain what causes the wear and tear of your tyres and when it’s time for them to be replaced. In years gone by, it was not a rare occurrence for a vehicle to travel more than 50,000 km on a set of tyres. Those were the same days when it was a normal practice for us to inflate our tyres at 2 bar all round. How times have changed! Let’s not forget technological advancements. Why, then, do we not see the same lifespan increase in tyres that we see in the development of the motor vehicles to which they are fitted? The answer could be described as an “oxymoron” – a bittersweet victory for motoring! Vehicles have advanced technologically; and with this advancement came increased performance and a higher level of safety requirement for vehicles. Let us not forget changed driving habits. We simply do not drive the motor vehicles of today like the vehicles of ten years ago: vehicles accelerate faster and require shorter braking distances; and all this happens on a road infrastructure that does not receive the maintenance it should. So, when the components that are responsible for keeping your vehicle on the road are expected to perform under these conditions, wear is inevitable, at the cost of lifespan - especially when you expect your tyres to stop your vehicle safely in any given circumstance. The laws of physics require that there be a slip force transmitted to the road, regardless of whether the force involved is circumferential, as in the case of acceleration and braking, or lateral, which occurs during cornering. Slip means that the vehicle’s speed is greater, or less than, the wheel’s circumferential speed, or the distance the vehicle covers is longer or shorter than the rolling circumference of the tyre. A greater degree of slip is evident on ramps in parking garages. Next time you park your car, take notice of the amount of rubber found on these ramps. An increase in tread wear is related to the amount of slip. Twice as much slip translates into four times as much wear. In the case of gentle, brisk acceleration on a dry road surface, slip values of up to 2% are attained. Values as high as 20% are possible if the car is driven to its limit. Depending on a driver’s driving style, whether economical or high performance, comparable tyres can yield mileages of anywhere between 5 000 and 40 000 km. Tyre maintenance also plays a crucial role in tyre life. Consider your vehicles engine: the manufacturer informs you that it needs to be serviced every 15 000 km; and that failure to do so will result in reduced engine life. The same principle applies to your tyres. Tyre maintenance would involve a pressure check at least once a month, wheel alignment every 10 000 to 15 000 km and tyre rotation, depending on the drive axle of the vehicle and if the vehicle has mixed fitment. So, when your tyres are up for replacement again, try to remember how the vehicle was driven over the life of the tyres and what the road conditions are like on the roads most often travelled. If you were almost involved in an accident, think past the braking system fitted to your vehicle and remember that the braking system would not have worked as effectively without the tyres fitted to the vehicle. The vehicle manufacturer tested these tyres to perform best with the overall safety package of the vehicle. BestDrive Tip: A smooth driving style contributes decisively to gradual, uniform tyre wear. The conditions of use, vehicle load, average speed, road condition, tyre pressures, tyre maintenance cycle and features specific to the vehicle have an impact on tyre wear - and in turn on the tyre’s perceived mileage expectation. It is recommended you consult a professional tyre dealer, such as your nearest BestDrive tyre fitment centre, regularly to assist you in getting the best possible mileage from your tyres. Tyre Rotation: Even though this is not possible on vehicles that have different tyre sizes on the rear of the vehicle to the front; on the majority of vehicles on South Africa’s roads, tyre rotation is important. BestDrive recommends that your tyres get rotated every 10 000 to 15 000 km; and if this is too much of an inconvenience, request that your vehicle dealership rotate the tyres each time your vehicle goes in for a service, with the average service intervals currently sitting at 15 000 km. Wheel Alignment: This must be checked every 10 000 to 15 000 km. Some vehicle manufacturers recommend every 10 000 km. Wheel alignment is a sensitive setting on your vehicle and all it could take to upset this setting is hitting a curb. If you hit a curb or pothole, it is recommended that you have the alignment checked as soon as possible, as this could have misaligned the wheel(s). It may not pay to wait for the next planned maintenance check. At BestDrive fitment centres, we offer the service of checking and correcting the wheel alignment of your vehicle. There are several different parameters of wheel alignment on a vehicle; some are adjustable and others not; and some will affect tyre life and others not. These parameters are in fact designed into the vehicle as a means of reducing stresses and strains on its suspension components. Let us have a look at some of them. Toe Settings: This is the inward or outward pointing of the wheels in relation to the centre line of the vehicle and is set to take up any slack in suspension joints (the modern vehicle has very tight tolerances, so the settings are far less than they were a number of years ago) so that the tyres will, in fact, run parallel with one another when the vehicle is travelling in a straight line. Too much toe will dramatically reduce tyre life. Camber: This is the tilt away from the vertical of the wheel and is designed to place the wheel loading on the larger inner wheel bearings of the front wheel on rear wheel drive vehicles. Too much camber will cause a tyre to wear off on the shoulder. Differing camber angles from one side to another will cause the vehicle to pull to one side. Caster: The backward tilt of the steering axis is designed to give feel on the steering, as well as provide steering self-centring, so the steering comes back to the straight ahead following a corner. Too little caster will cause the vehicle to wander - and too much will cause heavy steering. Steering Set Back: The angle where one wheel is ‘set back’ from the other. If a vehicle has a high steering set back, the vehicle will pull toward the side where the wheel is set back. This can often occur when a vehicle has been involved in an accident. Steering Axis Inclination: This is the tilt from the vertical of the steering axis and is designed to create a vertical load through the axis in order to reduce stresses and bending moments on suspension components. Thrust Angle: This is where the rear wheels are out of line with those on the front and the vehicle will have a tendency to ‘crab’. Again, this can occur when a vehicle has been involved in an accident. Scrub Radius: This is the radius created between the centre line of the wheel in contact with the road surface and the line drawn through the steering axis. This can either be positive, where the wheel positioning is on the outside of the steering axis line; or negative, where the wheel positioning is inside the steering axis. Scrub radius may also be referred to as Roll Radius. Changing the offset of the wheels on the vehicle will change the scrub radius and could severely affect suspension component life, due to increased stresses being placed on them. In order to preserve the wheel alignment on a vehicle, avoid potholes, climbing curbs and parking up against curbs. Just because your tyres are wearing off smoothly, does not mean to say that the alignment is correct. Alignment should be checked every 10 000 to 15 000 km or 6 months, whichever occurs first – unless you know that you have hit a pothole or some other object, in which case it should be done immediately as a precaution. When one considers that the tyre is the only contact that the vehicle has with the road and that it has to provide the necessary grip with the road, it makes sense that they be in good condition and looked after properly. How often have we heard, “Well, can’t it be repaired?” or “It will be OK as a spare”. Many tyres are repaired when they should never have been. Others are repaired as a temporary repair only, but are sold to us as an acceptable ‘permanent’ repair. These are potentially dangerous tyres - and you may never know that. It must always be remembered that a tyre that has been repaired can be described as a tyre that has had an injury. It will never have the casing strength that was originally built into the tyre; it now has a weak spot, which could well have had moisture or other contaminants creep into it, which in turn will start to affect the bond between the components – not to mention the strength of the components in the tyre. Certain categories of tyres should never be repaired, especially high performance tyres, while those that can be repaired can only be repaired in the tread area. Any tyre that is known to have been injured or have had a puncture must be removed from the wheel rim, inspected and then the suitable combination plug/patch repair can be carried out on it. A plug repair that is carried out without the tyre being removed from the wheel rim and inspected on the inside is only a temporary repair and is designed to get you to the point where you can have the tyre replaced. 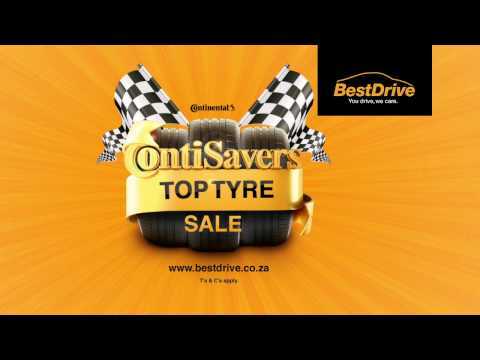 It is important that you consult a reputable tyre dealer, such as BestDrive, for tyre repairs. Ensure that they have the correct equipment and carry out a full inspection on the tyre before sending you on your way. Please remember that no tyre manufacturer recommends a repair on the sidewall of the tyre and most manufacturers void the warrantee on their tyres once they have been repaired. Don’t risk your life and those precious to you on shoddy repairs and indifferent advice. Visit BestDrive for reliable and professional tyre repairs and tyre care advice.